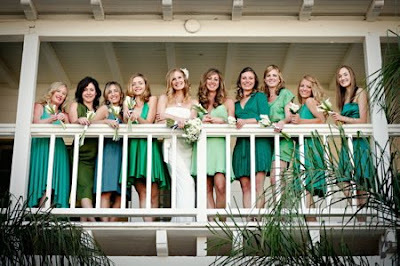 I LOVE mismatched bridesmaids dresses!!! 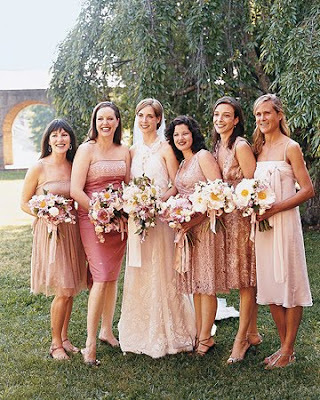 I went with Davids Bridal's new coordinated looks bridesmaids dresses AND since I got my bridal gown there, all my bridesmaids got $20 off which was great news! anybody have great suggestions for flower girl dresses? dee--i love all your ideas!!! love it! its what i plan on doing! I have a quick question...I'm a future bride and I love the blue dress idea! My sister, who will have had a baby just a few months before my wedding, likes the dress all the way to left. However, I can't figure out where this dress came from. Do you remember where you found the picture or have any idea where to get more information about that dress?